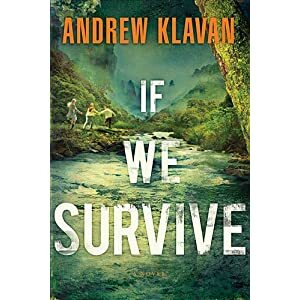 If We Survive is a story about a group of young people along with their pastor that travelled to small South American country to help rebuild a school that rebels (called the Volcanoes) have destroyed. The country happened to be on the verge of a revolution while the young people were down there. Soon before they were ready to leave, they find themselves running for their lives in danger of being executed from the rebels. They seem to find new perilous circumstances around every corner, battling nature and an army of rebels. I generally enjoy Andrew Klavan books. Andrew's previous release (Crazy Dangerous) was a great mystery, and had my attention the whole way through, it kept you guessing. I was hoping for similar intrigue and mystery that Crazy Dangerous provided it's readers when I requested to review If We Survive. I was disappointed with the mystery aspect, the only mystery in this book are the characters and how they became the way they are. That being said, this was not labelled in the mystery genre, it is a young adult adventure book, and for that genre If We Survive delivers. You will find the book to be a page turner with action from beginning to the end. I enjoyed the character development and growth that you would expect to see in young people going through a traumatic experience. The book felt like it was telling a non-fiction story and that made it all the more interesting to me. All in all, I enjoyed the book and I am exited to share it with a few young people that I know will enjoy it. 4/5 stars. This book was provided to me for free by Thomas Nelson's booksneeze.com reviewers program, for my honest review.